Way back in 1992, animator Craig McCracken brewed up a cartoon short dubbed “Whoopass Stew!” while enrolled in art school. A few years and a name change later, Cartoon Network aired his creation, The Powerpuff Girls, as part of their “What a Cartoon!” showcase. The official Cartoon Cartoon then premiered in 1998 and went on to enjoy 78 episodes of 136 segments, numerous specials, and a feature film, not to mention a bevy of merchandise, winning two Primetime Emmy awards along the way. Jump to 2016 when the McCracken-less rebooted version of The Powerpuff Girls made its debut on Cartoon Network. 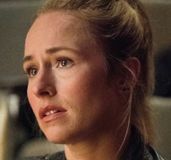 Amanda Leighton, Natalie Palamides, and Kristen Li stepped in to replace Cathy Cavadini, Elizabeth Daily, and Tara Strong as the voices of Blossom, Buttercup, and Bubbles respectively, a move which was not very well-received by fans of the original award-winning series, partially because it came as a blindside to the original cast. However, the reboot, which earned a Primetime Emmy award nomination in its debut season, and also features the return of voice actors Tom Kane and Tom Kenny, deserves much better than the fanimosity that’s been directed toward it. The curated collection of 12 episodes from the first season on DVD in The Powerpuff Girls: Tiara Trouble is a wonderful example of the title trio’s longevity and ability to bring action, humor, and heart to audiences young and old, new and returning. The DVD, which is available now (just in time for Valentine’s Day! ), features a dozen 11-minute episodes, including the highest-rated episode, “Viral Spiral.” The Powerpuff Girls: Tiara Trouble was also my first experience viewing the rebooted series. 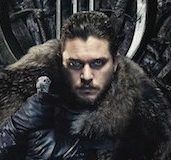 My expectations were low considering the backlash that occurred when the voice cast was announced and the dreadful ratings given to the show on IMDb. These absurdly low ratings are driven more by spite and nostalgia-skewed opinions than anything objective. In fact, I was genuinely and pleasantly surprised that the new versions of The Powerpuff Girls felt like a continuation of the original series despite a nearly wholsesale change in the creative team behind the scenes. 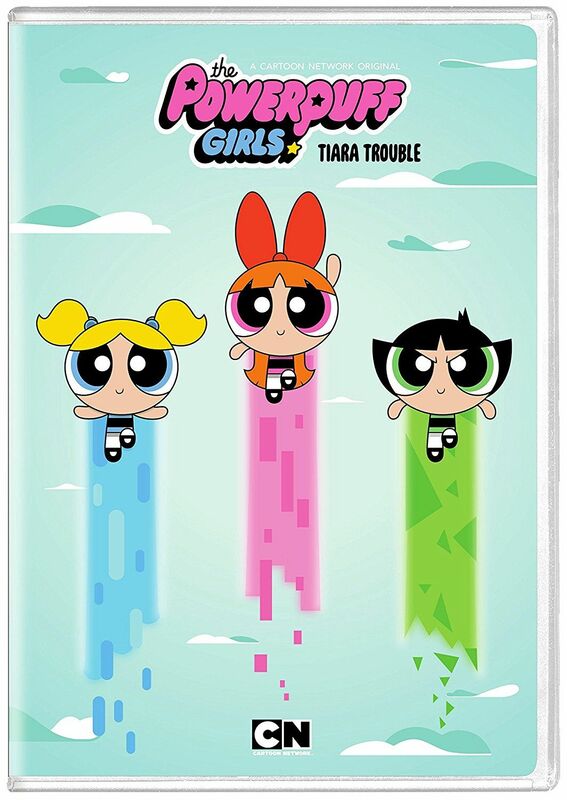 The Powerpuff Girls keeps the same iconic style of humor in this new version, playing up the cutesy aspect of our heroes while being honest with the portrayal of their phenomenal powers and, at times, difficult duty of protecting Townsville and its citizens. It also stays true to the fact that the three little girls are just that, little girls; for every time they have to knock down a giant robotic tree or rescue the Mayor from Monster Island, they also have to deal with Picture Day at school or navigating the pitfalls of social cliques among their classmates. 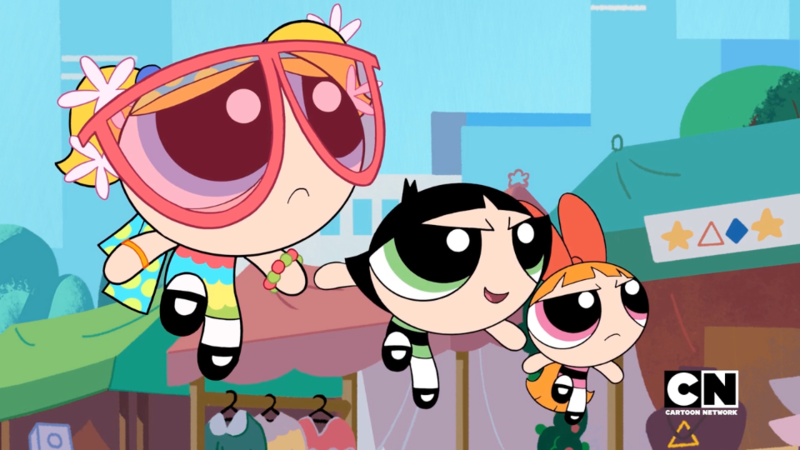 Blossom remains the leader striving for perfection, Buttercup is still the tough, no-nonsense upstart, and Bubbles is as cute and sweet (and terrifying when angered) as ever. Even familiar villains like Mojo Jojo, Fuzzy Lumpkin, the Amoeba Boys, and HIM return. But there are some new twists to the reboot. 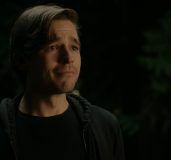 New villains like Manboy (with the powers of a man in the body of a boy) take shots at the mansplainers and misogynist trolls in today’s internet-connected social minefield, the boy band “Sensitive Thugs” becomes a running gag throughout the season, and supervillains can even call up freelance monster attacks through a mobile app. It’s intentional that this new version of The Powerpuff Girls was crafted for the internet age. 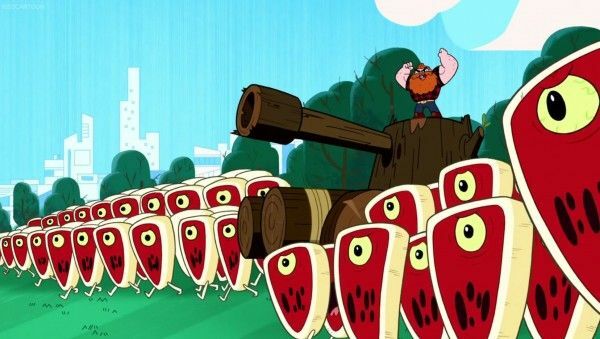 The humor has gone from 90s quirk to the even more random and frenetic energy of the current decade of animation, influenced by shows like Adventure Time. Also apparent are the nods to pop culture, like references to the classic Phantom of the Opera in “Bubbles of the Opera” and the more contemporary nod to The Hangover in “The Stayover.” For me, these updates freshen up the property and bring it into the modern era without forgetting or misunderstanding what made the original series so popular. Yes, things have changed: the theme song has morphed into a contemporary pop punk rendition that’s just fine as its own thing, the lead voice actors are new but still deliver the core characteristics of their respective characters, McCracken was not involved, and Ms. Sara Bellum is gone (which is worth a discussion in its own right, as is the presumed transgender theme in “Horn, Sweet Horn”). But rather than getting caught up in the pull of nostalgia or being distracted by manufactured controversy, it’s worth viewing the new version of The Powerpuff Girls on its own merits because it’s a solid cartoon that delivers on its promises. If that’s too much to ask, then just stick with the original, beloved series. The downsides of the DVD itself: There are only 12 episodes, a curated dozen out of the full 39 available in the rebooted show’s first season; in other words, don’t get this confused with The Powerpuff Girls Season 1. Also, this is a barebones DVD that only includes those episodes. No special features are included at all; it does, however, come with some cool stickers. Just some things to keep in mind if you decide to pick this up.